WRGreens second nomination meeting has filled our slate of 2019 WRGreens candidates. Congratualations! With all our candidates chosen, our 2019 candidates first official outing was the following Saturday’s pancake flipping team at the 2019 Elmira Maple Syrup Festival. In 2015 WRGreens only female candidate was Michele Braniff in Cambridge. In 2018 we got closer to gender balance when Stacey Danckert ran in Kitchener Centre provincially. But now, in 2019, we are especially pleased to note the WRGreens gender imbalance now swings the other way, with 3 of our 5 (60%) candidates being women. Congratulations to all our 2019 candidates! On Wednesday February 20th, 2019, Mike Schreiner made history again when he introduced his first Private Member’s Bill in the Legislative Assembly of Ontario. In the face of climate change, resource extraction and sprawl, Mike’s draft legislation seeks to protect the Paris Galt Moraine, an essential water ecologically sensitive recharge area in the Grand River Watershed which naturally purifies water for the citizens of Guelph and the surrounding area. Bill 71 would amend the province’s Planning Act and Development Charges Act to more strictly regulate development that could jeopardize the moraine’s integrity. Mike wrote the draft legislation over a period of months where he consulted with water experts and Ontario stakeholders, including First Nations, municipalities, farmers and MPPs from all parties. With this important legislation, Mike has demonstrated the Green Party’s core commitment to participatory democracy and consensus based governance by building all-party support, which resulted in the bill’s passage at Second Reading on March 7th, 2019. “I’m glad my colleagues unanimously showed their commitment to Ontario’s water today. Safeguarding water and food-growing farmland should not be partisan issues. Let this be a first step towards all-party collaboration to protect the places we love,” said Schreiner. There was a packed house for the Kitchener Centre and Waterloo Green Party nomination contest, held at Descendants Brewery on Wednesday, 6 March 2019. Congratulations to Mike Morrice for winning the Kitchener Centre nomination, and to Kirsten Wright for winning the Waterloo nomination! And many thanks to all those from the Waterloo Region Greens who helped put on this event, the largest Green Party nomination contest in Waterloo Region history! We’ll have musical entertainment provided by local musicians Joni NehRita and Craig McNair. Donations will be accepted to cover the evening’s costs, pay our musicians and fund the campaigns. To vote, you must have purchased a membership no later than February 4th, 2019, or if your membership has lapsed within the last year (+90 days), you will have the option of renewing it at the event. This is a free event, but please register at Eventbrite. Ian Graham has lived in Kitchener Centre since 1994 and seen many changes to the downtown core. He is a graduate of Wilfrid Laurier University, receiving a BA in Music in 1991. Ian was inspired to pursue a nomination for the Green Party of Canada because of his belief that we have the technology, resources, and will power to transform Canada to a better future with clean energy and make an environment that is healthy for all Canadians to be part of. Inspired by his Dad who bought a cottage and made it off grid, he realized that there are many ways to be independent and take better care of our environment. Ian also feels strongly that we can do better in our education system, giving the benefits of art, music and even financial knowledge with the foundations of core subjects. Health care has been ever more on his mind as he has seen the impact of dementia on his Mom recently. Ian has been employed in many things from music to technology. He is one of the founding members of WREVA (Waterloo Region Electric Vehicle Association) who hosts the largest event in Canada for National Drive Electric Week. With his passion for renewable energy, Ian walks the walk, having installed multiple solar arrays and driving everything from a van on vegetable oil to multiple electric cars. He researches the economics and investments of renewable energy and feels that Canada has a huge opportunity for this trillion dollar economy. He feels strongly that moving to a clean energy economy has the benefit of numerous jobs, independence and even more importantly, taking the strain off of our health care system. Ian is a huge fan of the band RUSH, passionate for hockey, playing 3-4 times a week himself and cheering on the Maple Leafs, and enjoys being away at his family’s off grid cottage north of Manitoulin Island. He also has been the organist at St. Columba Church in Waterloo for over 28 years and works with many local musicians helping them record their music. Ian looks forward to learning new skills and abilities with the Green Party in 2019. Mike Morrice grew up on the west island of Montreal as the middle brother of three boys. His family moved to Newmarket Ontario in 1997, and in 2003 he went on to study at Wilfrid Laurier University, completing a double degree in business and computer electronics. Mike was quickly hooked by the entrepreneurial spirit of Waterloo Region. After reading a book called Ishmael, his eyes were opened to how recently we have begun living at odds with the rest of the living world. Mike was inspired to bring together his business training with his desire to see more decisive action on the climate crisis, and so he got to work. Mike has spent the 10 years since working with hundreds of business to accelerate the shift to a green economy. In 2008 while studying at Laurier, Mike founded Sustainable Waterloo Region (SWR) and piloted Canada’s first Green Economy Hub. Within five years, the Hub had engaged companies employing 14% of Waterloo Region’s workforce, all committed to setting and achieving voluntary climate goals. Mike also spearheaded the creation of ClimateActionWR, a collaborative effort that secured unanimous support from Regional & City Councils for our community’s first-ever climate target (a 6% reduction by 2020, since raised to 80% by 2050), and initiated what is now evolv1, Canada’s first net-positive energy multi-tenant building. In response to global interest in replicating Green Economy Hubs, Mike founded Green Economy Canada in 2013 and led the award-winning organization until late last year. Today there are 7 Green Economy Hubs across Ontario supporting over 250 organizations lowering their impact and increasing their profitability. Mike was named Young Alumni of the Year by Laurier (2011), Young Entrepreneur of the Year by the KW Chamber of Commerce (2012), won a Special Citation for Social Entrepreneurship by EY Canada (2018), and has been an Ashoka Fellow since 2012. Mike describes his journey starting Sustainable Waterloo Region in a TEDx talk on his website. You can also follow the campaign on Facebook, check out his online resume, LinkedIn profile, and Twitter profile. Bob Jonkman has championed Proportional Representation since he volunteered for Fair Vote Canada in the 2007 referendum. As an Executive Member of the very active Fair Vote Waterloo Region Chapter, Bob came to believe electoral reform could best be accomplished by entering politics. He ran for office federally in 2015 and provincially in 2018 as the Green Party candidate in Kitchener—Conestoga. Working with local social justice organizations has helped foster Bob’s commitment to achieving the goals of equity and inclusion. His community service includes work with the WRNonviolence Day In The Park, KWPeace, and as an active member of the Social Development Council of Waterloo Region. Bob has volunteered with the PTA, worked to save Victoria Glen Park from development, fought the placement of a biogas mega plant in downtown Elmira, and served on the Elmira BioFuel Citizens’ Committee. In his spare time Bob enjoys participating at CKMS-FM, the local community radio station where he is on the Board of Directors. Bob’s digital community service includes organizing and giving presentations at computer user group meetings. As a long time member of the Free Software community, Bob encourages the use of software that respects computer users’ freedom. He’s a strong advocate for transparent government and freely available Open Data in government and business, balanced with protection of personal privacy through cryptography and safe online practices. Professionally, Bob is a small business owner providing computer consulting, technical support and training to large and small Ontario businesses. Born in the Netherlands and raised in Burlington, Ontario, Bob and Laurel chose to move to Elmira to raise their son twenty years ago. Bob’s commitment to the Green Party is rooted in shared values that have inspired his work to enact positive change for a stronger democracy and a sustainable future. 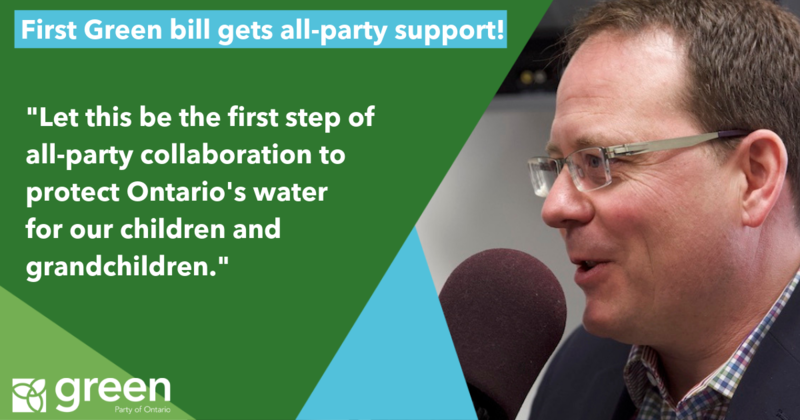 I tabled the first ever Green legislation in Ontario history, a bill to protect the drinking water supply of nearly 200,000 people in the Guelph region. And I did it with dozens of water defenders at my side. It’s time we started taking seriously our sacred responsibility to leave a liveable planet for our children and grandchildren. The Paris Galt Moraine Conservation Act would protect our water from contamination, urban sprawl and reckless resource extraction. And while the Premier has been threatening to poke holes in the Greenbelt, this legislation would grow the Greenbelt, conserving more farmland and wildlife habitat. We face an uphill battle. Majority governments don’t pass many opposition bills. So I need your help to write to your MPP and sign my petition urging the government to #ProtectOurWater. Go to ProtectOurWater.ca today and help us make history again! Tell your MPP you support the Paris Galt Moraine Conservation Act! Use the GPO’s handy letter writing tool at ProtectOurWater.ca to find your MPP and send them an email.